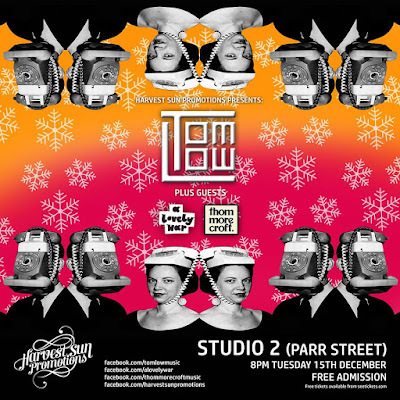 LIVERPOOL'S latest starlet, Tom Low has joined forces with the notorious Harvest Sun Promotions to create a special Christmas free-for-all at Parr Street's Studio 2. As the last gig of the year for the young Tom Low, the red carpet will be laid out for gig-goers, offering a taster of his long-awaited EP whilst also showcasing two more local talents, A Lovely War and Thom Morecroft. Famous for his trippy vocalism, front-man Thomas McConnell, Tom Low, offers up a new electro-psych pop, full of fun but tainted with sincerity which was delectably snapped up by local label Deltasonic not to long ago. Complimented beautifully by the guys at A Lovely War who are known for creating experimental happy-go-lucky vibes and acoustic-based artist, Thom Morecroft, the night is set to be one hell of a party. Be sure to head down and secure your free tickets by clicking here.